Having your hearing checked could not be simpler. Hear Again provide a free, no obligation, in home hearing assessment which allows you to find out if your hearing is showing any signs of deterioration and whether assistance is needed. As all our equipment is easily portable, our professional Clinicians can bring the clinic to you. With a quiet room to work in and a table to set up a laptop with other small modules, we can conduct a full diagnostic hearing test. We can also fit and service hearing devices from all manufacturers without you needing to leave the comfort of your own home! Appointments can be scheduled outside of office hours or even at weekends. Using a magnified otoscope, your Clinician will look in your ears to check for wax blockages and any other abnormalities which may affect your hearing or ear health. Wax presence is normal and part of the ear’s natural cleaning mechanism, but excessive wax can cause problems. Your Clinician will advise you the results of this check and your best next steps. Using a highly tuned Audiometer, your Clinician will play a series of beeps and tones to you and ask you to respond when you can hear them. By doing so, we establish the very quietest level of sound you can hear at a variety of different pitches. Comparing your hearing levels to ‘normal’ hearing levels, we can determine which sounds you may be missing and why you are experiencing hearing difficulties. Your Clinician will play you a recording of simple words and ask you to repeat what you think was said. This check allows us to establish which speech sounds you can hear and which you are missing. 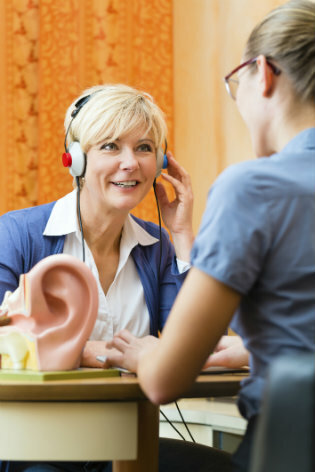 Speech Audiometry is also a very good indicator for the potential benefits hearing devices could provide for you. A very easy check (as you don’t have to do anything!) allows us to establish the health of your ear drum and middle ear function. This is a secondary check which helps to screen for Conductive Hearing Losses and is performed by placing a small rubber plug into the entrance to your ear canal. By gently changing the air pressure in your ear we can measure how your ear drum responds to this. Your Clinician will explain the results of the Hearing Assessment and advise you regarding your future hearing healthcare. If your hearing proves to be within normal limits, we will schedule to see you at some stage in the future to keep a check on this. Should a hearing loss be evident, your clinician can discuss the options which are open to you; this may involve a referral on to another medical professional or to investigate potential hearing device options. Hear Again is fully independent and all our appointments are provided with no obligation; your comfort is our priority!